It is distressing to see a family member lying on the hospital bed, battling for life because of misdiagnosis. Tashfeen Suleman, CEO and Co-Founder, CloudMedx witnessed a similar situation when his father went into coma because of subdural hematoma caused due to misdiagnosis and wrong medications. Although he gradually recovered after a surgery, according to researchers at John Hopkins University, misdiagnosis causes permanent damage or even death to as many as 1,60,000 patients annually. Healthcare providers across the nation are seeking to take advantage of technologies like big data and analytics to minimize death rates, derive actionable insights, and avoid any such mishaps. But often, CIOs end up working with multiple technology vendors which adds to the complexity, increases manual work and gaps in data. CloudMedx is a big data cognitive computing company that is bringing predictive analytics to healthcare. It provides a comprehensive platform that streamlines clinical encounters and optimizes patient outcomes. “Our platform generates key clinical insights for patients at every point of care such as risk profiles, gaps in care, and adverse drug reactions using advanced machine learning and evidence based medicine,” explains Suleman. The company’s platform, which is exerted either locally or through cloud, can integrate well with the users’ existing workflows and Electronic Health Records (EHR). The tool can extract and analyze unstructured data hidden in EHRs and health IT workflows, providing deeper insights in a short span of time and optimizing workflows. Care providers and executives are able to look at data in real time, generate reports without involving IT, and create workflows using the company’s drag-and-drop tools. Alongside, the firm’s robust analytics platform provides real-time visual insights and predictive analytics on a per-patient level as well as around population clinical risk and outcomes based on machine learning and natural language processing. The organization’s offering, MedxExchange, secures customers’ data on the cloud and allows easy access and clear interpretation of clinical claims and existing workflows. This brings disparate datasets into one place and allows clear interpretation of clinical claims and workflows. 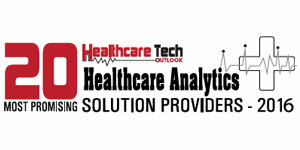 “We offer all-encompassing data aggregation that spans over 30 EHR systems, commercial and government health plan contracts as well as existing workflows,” explains Suleman. To help chronic patients improve and maintain their health, the firm offers MedxCare, a care management tool, which offers insights into patients’ data directly into workflows such as EMRs or dashboard and brings better communication, seamless handoffs, and intuitive care planning—all in one platform. Besides, the firm also delivers MedxInsights, which is an API based advanced clinical decision support engine directly into workflows and IT systems that serves both administrators and clinicians at the point of care. It generates actionable insights around quality and performance while stratifying population risk, filling in critical gaps, and better diagnosis in real-time. In an instance, CloudMedx assisted a client that had issues around lack of clinical decision support and was losing revenue due to gaps in care and high re-admissions. CloudMedx’s platform helped the customer reduce readmissions, predict risks and capture bonus payments. CloudMedx recently acquired Gyrus Labs, a cognitive computing firm for healthcare and launched two new modules, one of which is a risk stratification based on NLP and machine learning, while the other module is for chronic care management. “We are working on cutting edge technologies using evidence based medicine and clinical protocols to improve clinical encounters,” concludes Suleman.